Activity at the Roush CleanTech plant in Livonia has seen big increases in recent months. And that growth is showing results: The company boasted its biggest sales month this summer for propane engines for school buses, a technology it believes will continue to grow. Almost 11,000 of our propane autogas vehicles are on the road today. To ensure that each and every vehicle and customer is properly supported, we’ve hired new field service engineers, brought another trainer on board, created a dedicated customer support department and added new tools. The Martins Ferry City School District has upgraded its bus fleet with three new vehicles that should help the system realize savings in maintenance and other costs by using propane rather than diesel fuel. Ashland’s carbon footprint will be a little smaller and the school district’s wallet a little fatter after its second propane-powered school bus joins the rest of the fleet in the coming weeks, just in time for the 2016-17 school year starting Aug. 29. Following an executive session, Tuesday, August 16, the Board of Education approved a new five-year contract with All-Star Transportation for the 2017-2022 school years, according to Board of Education Chair Keith Alexander. The district bought 25 new busses for the Pocono Mountain West Campus. “It’s a ford 410 motor. It’s something you would see on a typical ford truck. The only difference is it’s liquid propane that’s being injected,” explains Donald Kunkel, PMSD Vehicle Maintenance Supervisor. They’re environmentally friendly, also cheaper to fuel and maintain. The Propane Education and Research Council (PERC) presented the inaugural Leadership with Propane Autogas Awards at the STN EXPO last month in recognition of school districts that have demonstrated a commitment to sustainable practices through the use of propane autogas school buses. Eleven alternatively fueled school buses are now transporting students in the Metropolitan School District (M.S.D.) of Warren Township, Ind. The fleet represents the largest deployment of propane autogas school buses in the state. Legacy Bus Sales in Saskatoon helped its customer, Regina Catholic School Division, unveil their new propane buses at a press conference on August 10. They even rolled out the green carpet to welcome attendees! Legacy Bus Sales enlisted the help of ROUSH CleanTech, RCSD and Blue Bird to create a successful event to gain attention in the local and national media for their customer’s new fleet. The four organizations discussed the best news angle to attract media attention. They developed key messaging: all of RCSD’s new bus fleet of 89 vehicles are powered by propane autogas, and that this would be the largest fleet of propane buses in Saskatchewan. A media alert was distributed to local area reporters informing them of event details. RCSD reached out to local government officials, school board members, principals and others in the school district, inviting them to attend. To add a fun element, the folks at RCSD wanted a “green” theme because of the emissions-reducing benefits of the propane-fueled buses. 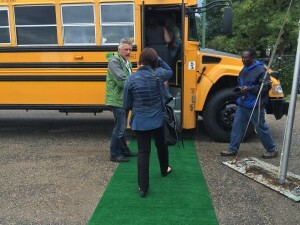 A green carpet rolled out toward one of the school buses, encouraging media and attendees to enter the bus, and a green ribbon further illustrated the environmentally friendly aspects of the fuel. Another personalized touch was to have one of the school’s deacons bless the buses. One unexpected twist was thrown into the mix just days before the event. Looking at the weather forecast with 80 percent chance of rain, the team came up with alternative plans, as the event was set to take place outdoors. They determined that the event would move a large tent closer to the buses to make it more accessible and provide additional cover from the elements if needed. Along with the rain came the reporters, local dignitaries, RCSD’s director of education and other school staff. Representatives from the team included Jess Henderson from ROUSH CleanTech; Max Bouchard with Blue Bird; David White with LP3 Transportation Solution; and Ward Hepting from Legacy Bus Sales. Events like these require many helping hands. That’s why ROUSH CleanTech developed the Blue Bird Dealer PR Support Program to help. If you’re interested in hosting an event similar to this with one of your customers, please reach out to your ROUSH CleanTech or Blue Bird sales manager to begin planning! Following RCSD’s press conference, a press release was sent to local reporters and national trade publications to further spread the news. Here is a sample of the media coverage. What would you do with $2.7 billion? 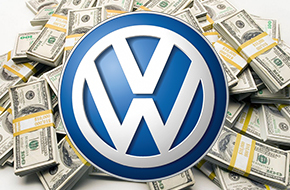 That’s the portion of settlement money soon to be available for replacing aging diesel vehicles (including school buses) as a result of Volkswagen cheating the federal emission laws for diesel cars. The open comment period for the settlement decree closed on August 5, and are currently being reviewed by the government and Volkswagen. We expect in the next month or so to hear an announcement of the final approved program, outlining the who, what, where, when and how for the grant funding distribution. Contact your local Clean Cities coalition and introduce yourself. Contact your state energy office to discuss a proposal with them. You can find a list here: http://www.naseo.org/members-states. Most likely, they’re looking for suggestions on how to spend the money, so the more people you can speak with before the policy is set, the better. 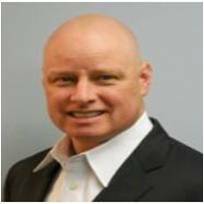 Contact your ROUSH CleanTech sales rep and put together a turn-key program. Your ROUSH CleanTech sales rep has templates to work from to put a turn-key funding program together. Most state energy offices will be looking for plug and play funding programs, and we have knowledgeable folks on staff who have successfully put programs like this together in the past. Let us work with you to put one together for your state. If you have any questions, please reach out to your ROUSH CleanTech regional sales manager or visit our website to find out more about the Volkswagen decree.